The past year has been tough for the satellite industry’s ‘Big Three’ satellite operators; now, however, the future confidences at Intelsat, SES and Eutelsat are more encouraging. An amazing track record—50 years have passed since the first sounding rocket was launched from Esrange Space Center. People in developing nations pay, on average, a full month’s wages for broadband—compare that with just 1.5 percent of monthly income in developing countries. That is one reason that only 40 percent of the world’s people are online. Telesat is a leading owner and global operator of geostationary communication satellites, providing reliable and secure satellite-delivered communications solutions worldwide to broadcast, telecom, corporate and government customers. Africa and the MENA region have been noted as areas with a huge population that are underserved by any means of communication—a great deal of effort is ongoing to bring comms access to those in remote areas. 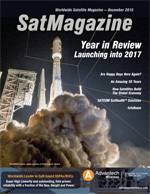 Year in Review 2016: Part VI, ND SatCom • Newtec • NOORSAT • Norsat International Inc.
ND SatCom • Newtec • NOORSAT • Norsat International Inc.